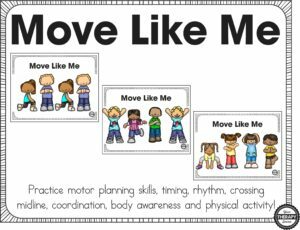 This Move Like Me freebie includes 2 sample pages for children to practice motor planning, crossing midline, body awareness, timing, rhythm, coordination and physical activity. Follow the movement patterns on the children pictured focusing on timing and rhythm of completing the actions. 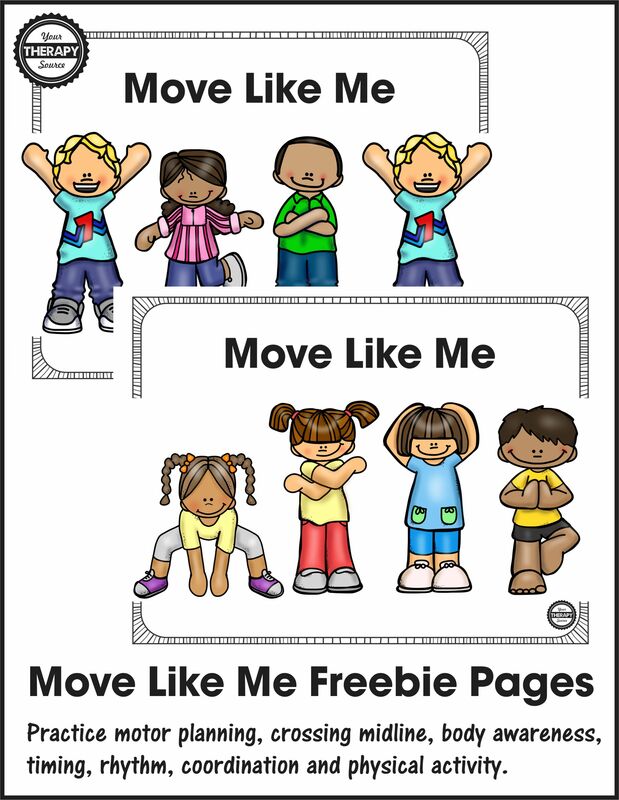 DOWNLOAD the Move Like Me Freebie. Get more information about the complete Move Like Me Packet download. This is a NO PREP activity. Simply print and play or project onto the whiteboard or tablet. There are 4 poses per page ranging from easy to hard. The first 12 are patterns, the next 12 include three actions (one is repeated) and the last 12 are 4 different actions. In addition, there are 3 pages with smaller pictures to include 48 poses per page. There are 7 additional activity ideas and game suggestions to try. Find out more information. Simon Says – Move your body to match the exact same body positions as the photographs in the picture cards. Personal Space Journey – Collection of activities to teach children about personal space including many body awareness exercises and a social story on personal space. 25+ Bilateral Coordination Exercises – Download of 28 bilateral coordination exercise sheets including QR codes with links to video demonstration of exercises. Also includes hand out explaining bilateral coordination.